Known for his solo work and as the front man in the loose and raucous The Feast of Snakes (featuring Peter Bibby's bass player Strawbs), O'Donnell sings in Cuss, writes the lyrics, played bass on the recordings, and plucks the guitar parts on a 60s Fyrbyrd guitar. Shakespeare, who has previously worked on Stella Donnelly's "Thrush Metal" album and an array of d.i.y W.A rock and roll, is the production man, developing and recording O'Donnell's songs and playing drums. 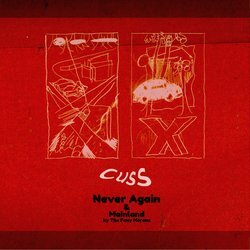 Since forming in early 2018 Cuss' line-up has evolved with O'Donnell and Shakespeare remaining the band's foundation. Their packed show at Fremantle's Hidden Treasures Festival in July in addition to popular shows at Mojos and The Bird has seen Cuss develop a name for themselves in W.A's thriving local scene. "Never Again" and "Mainland" were initially released to RTRfm only and are now available through Bandcamp. The song "Mainland" is a cover of Hobart band Foxy Morons' d.i.y hit from their self-titled 2017 ep. During a Foxy Morons show at Hobart's Brisbane Hotel, O'Donnell caught their Velvet Underground-esque song satirising the common story of young Tasmanians moving to the "Mainland". O'Donnell learnt the song and has brought it to a W.A audience.